It's time for the second of my 'Blog of the Week' posts. 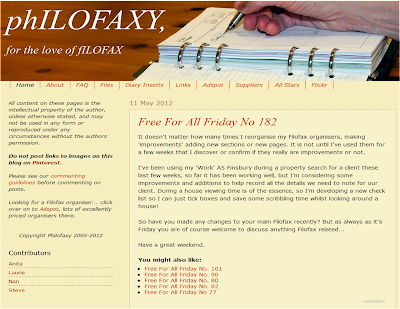 Each week, I'll look at a different Filofax blog and we'll hear from the owner. Some you may know already, whilst others may be new to you. This week, Steve talks about the phenomenon that is Philofaxy. It was started by Philofaxer in October 2005, joined by Nan in about June 2006, Laurie and Steve in June 2009 and Anita last week! Philofaxer bowed out due to other commitments in late 2006. I think the first post explains it better than one short sentence. I was asked to join the team in 2009 because at the time the blog was flagging a little and there were some quite nasty comments being left. I contacted Nan and suggested a few improvements. I had also been doing my own templates for a while and I posted links to them in the comments on Philofaxy. Laurie had been active on the site before me, with a few guest posts and lots of comments.. This post is way out in front with over 31000 page views. Then comes this one and this one. They both have over 10000 page views each. Popular series have been the Reader Under The Spotlight, any guest post or post that contains pictures of how people have set up their Filofax. Gosh difficult question... too many really. The one I had the most fun from because of the cruel way I wrote it was this one. I think I could easily write a list of 50 odd posts over the last 3 years and it still wouldn't find them all. The community that has built up around Philofaxy, the support, friendship and hunger for more information each week. And that new people are still discovering the site each week. Our growth rate has slowed down a bit now but the numbers are still quite big. How simple ideas thought up on the spare of the moment have become popular hits with our readers - to name a few: Webfinds, Reader Under the Spotlight, The All Stars Tour, The Skype Chats, Meetups. Where have you been! The Filofax user site on the internet. Don't be afraid to write about your own Filofax set ups. Make sure you tell Philofaxy about your blog. Take good pictures to show off your setups. Try to post regular, once every two weeks is a good starting point. Don't be afraid to ask for feedback. Try to find a niche within the Filofax arena. Ray and his custom inserts for instance. Steve has shared with me a lot more advice on Philofax blogging (and blogging generally) and am delighted that he's writing a guest post for me in which he will share many more of his ideas. Look out for this in the next few days. What a great idea - I missed the first one so obviously had to just pop back and have a read :o) Fabulous, fabulous, fabulous!!! LJ, Make sure you complete the questionnaire for your blog. I'd like to include it in this feature. Will add it to my To Do list in my wonderful A5 Holborn Zip - thank you :o) How's your personal doing? It's doing well, thanks. I'm enjoying finding uses for the big pockets. This has been very interesting! Even though I've known Philofaxy for a while now, there were still some new facts in here. I also loved that "cruel post" from Steve most. I bet he got flooded with outrageous emails and tweets afterwards, LOL! oooohhh, Jotje, I had your post bookmarked for months and would go back to it regularly to help with ideas for my yet-to-come first Filofax! I love that post! And I can imagine all the fun Steve had by writing that mystery post! It cracked me up! But yes, it was a very cruel post!